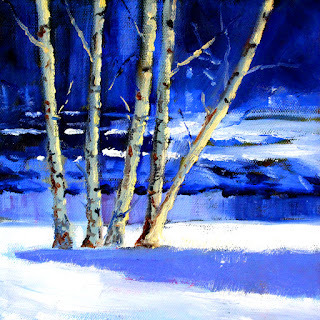 This is a small study of a scene from the banks of the Deschutes River in Central Oregon where the region experienced a record breaking snowfall last month. I am finishing up a larger version of this scene which should be dry fairly soon. Both are completed with oil paints on stretched canvas. This original study is for sale in my Etsy shop and reproduction fine art prints of the study are available at my print shop for a reasonable price. Eventually I hope that the larger original will be accepted by Ugallery along with some of my other larger landscape paintings. For all who have experienced a similar snowy winter, though beautiful scenery emerges, my hopes are for some warm weather in the coming days. 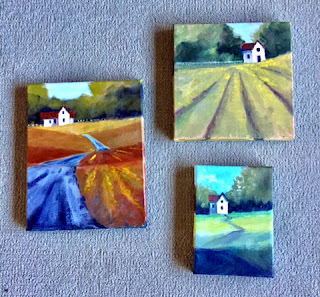 My little house paintings proved to be quite popular in my Etsy shop, so I worked on a few more and will start listing them in my shop this week. The largest in this picture on the left is 8x10 inches and the smallest on the lower right is 5x7. There are a couple more not shown in this photo because the paint is still wet, but as soon as it is dry they will join this trio of paintings looking for a new home. Hope you will stop by to see my shop full of small format original oil paintings. This painting was inspired by Mount Hood in the Cascade Mountain Range of Oregon. The range extends from British Columbia south to Northern California. It includes numerous peaks, both volcanic and non-volcanic. 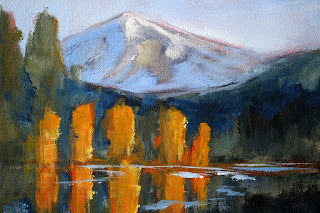 It is the views of many of the Washington and Oregon summits which I see most often in my travels and provide beautiful subjects for painting. I especially love the subtle range of color that reflects off the snow and rock. This painting was created with acrylic paints on an 8x10 stretched canvas. The original is available for purchase in my Etsy shop along with a similar, but smaller oil version. Click here to view this painting or here to see the smaller oil version.